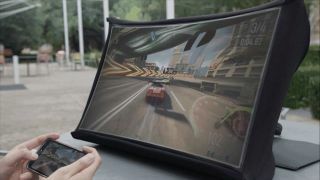 A 24-inch display that collapses like an umbrella for easy travel has found its way to Kickstarter where it's already blown past its funding goal by more than $100,000, and it still has 43 days to go. Meet Spud, short for spontaneous pop-up display. The concept comes from Arovia, a startup out of Houston, Texas, comprised of a core squad of six "makers" with several advisers. They set out to make a large size display that you could take with you and use with your laptop, smartphone, or tablet. When expanded, Spud uses custom optics and DLP technology to produce a 24-inch display with a 1280x720 resolution. Not being able to hit 1080p is a bit of a buzzkill, though Arovia says it decided on 1280x720 as a balance between cost and performance. "With higher resolution, the price of Spud would have significantly increased and the Spud chassis would have to be 20 percent larger. With lower resolution, higher-resolution images, like spreadsheets, could have been difficult to read," Arovia states on Spud's Kickstarter page. The other downside is that it doesn't work great in direct sunlight. However, it's battery powered, so if you take it camping or somewhere outdoors you won't have to hunt around for a power outlet. Spud connects to systems using HDMI, a Miracast wireless adapter, or via wireless dongle (Chromecast, Roku Stick, or Fire Stick). When connected, it can serve as a second display on the go or to mirror your portable device so you have something bigger to look at. The display collapses to about the size of a thick book and weighs less than 2 pounds. PC gaming isn't the primary focus with Spud, though as a secondary display next to your laptop, there's some utility there. Otherwise, gaming efforts are most reserved for playing mobile titles, like firing up a smartphone game. Arovia hopes to sell Spud next June for $499. In the meantime, there are some spots left on a few discounted backing tiers, if you're into the whole crowdfunding thing. You can find out more here.